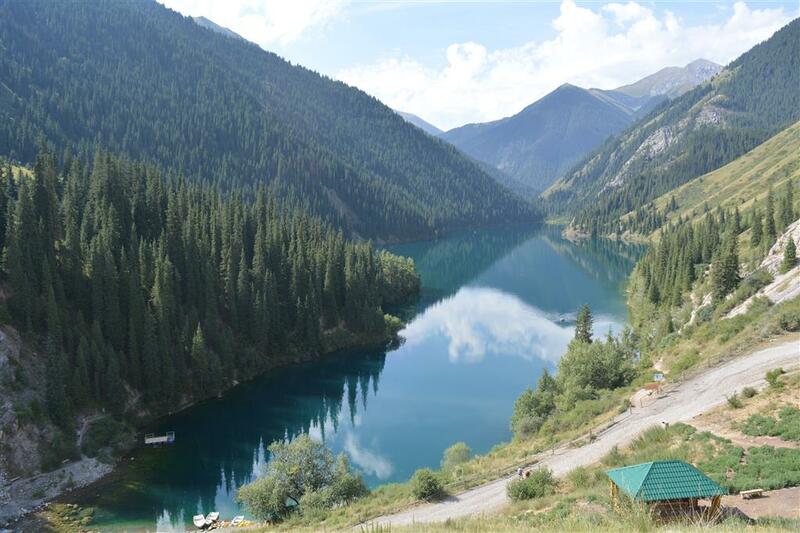 You travel with a guide-driver for three days in the province of Almaty, with start and finish in that city. (A finish at the Almaty airport is also possible). This part of Kazakhstan has a great diversity of landscapes, which you can experience in these three days. There are some variations possible. 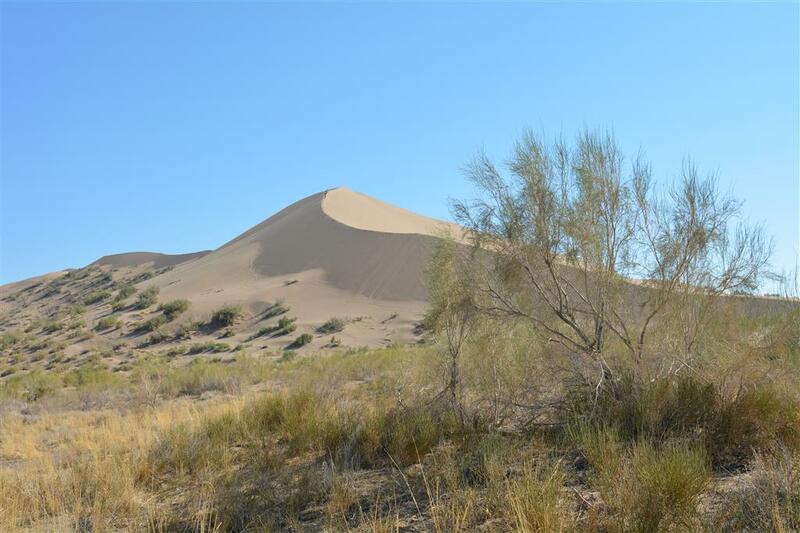 You can choose to include the Altyn Emel Nature Park in the program, a landscape of semi-desert north of the Kapachagai lake and the Ili River. In summer it’s pretty hot. 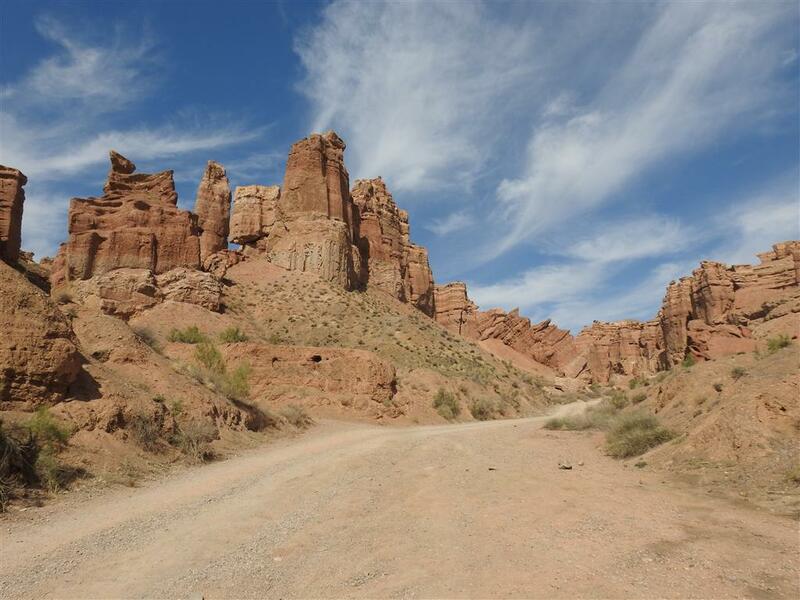 Or Charyn Canyon, often a part of any three-day tour in this area. The Kolsai Lakes and also Temerlik Canyon are good options as well, and last but not least the spectacular route through the mountains across the Assy Plateau and through the Turgen Valley. In the “program” tab, we have developed three itineraries. Please note that your driver-guide speaks basic English only, which is sufficient for most of our customers for a tour in nature & countryside. It is expected that you will assist the driver in setting up a camp and preparing dinner in case you opt for camping. However you may choose a fluent English driver-guide at additional cost. Day 1: Departure from Almaty in the morning. Transfer to Basshy village and entrance of the Altyn Emel National Park. Transfer to the Singing Dune. 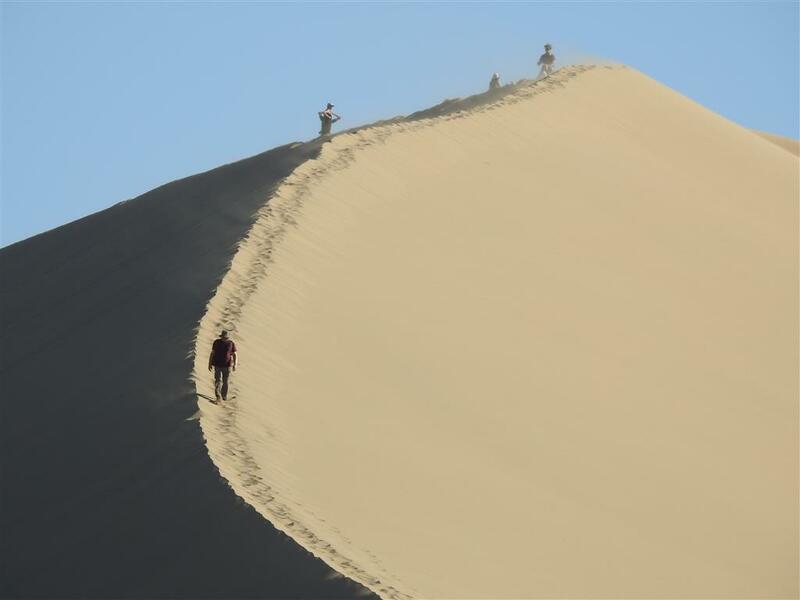 Walking around the Singing Dune, 2 hours. Transfer into the hotel near Basshy village 30 min. Day 2: Waking up, full breakfast. Transfer to the Aktau mountains (1.5 hours). Dirt road. Walking around the mountains for 2 hours. Transfer to the Saty willage near Kolsay lake, 4.5 hours. Stop for a night at the guest house in the Saty village. Rest. Russian sauna. Supper. Sleep. Day 3: Waking up, full breakfast. Transfer to the first Kolsai Lake, 30 min. Dirt road. Excursion to Lake Kaindy (1.15 hours) and two hours time for hiking. Return to Saty and lunch. Transfer back to Almaty (310 kms, 6 hours with stops), on the way dinner in a restaurant in Baiseit village. Transfer to the Charyn Canyon, 1 hour. Transfer to the Saty village, 3 hour. Transfer to the first Kolsay lake, 30 min. Dirt road. Transfer to Kaindy lake 45 minutes. Dirt road. Transfer to Kokpek village, 3 hours. Transfer to the Bartagoy Reservoir to the starting point of the climbing to the Assy plateau, and then to a picturesque place in the trees shadow near the Assy river, 3 hours. Camping. Walking. Rest. Bonfire. Supper. Sleep. Day 3: Waking up, breakfast. Excursion to the waterfall, 1.5 hours, light lunch. Transfer to the Temirlik canyon, 2 hours. Day 2: Waking up, breakfast. Transfer to the Saty village 3 hours. Transfer to the Kolsay lake, 30 min. Dirt road. 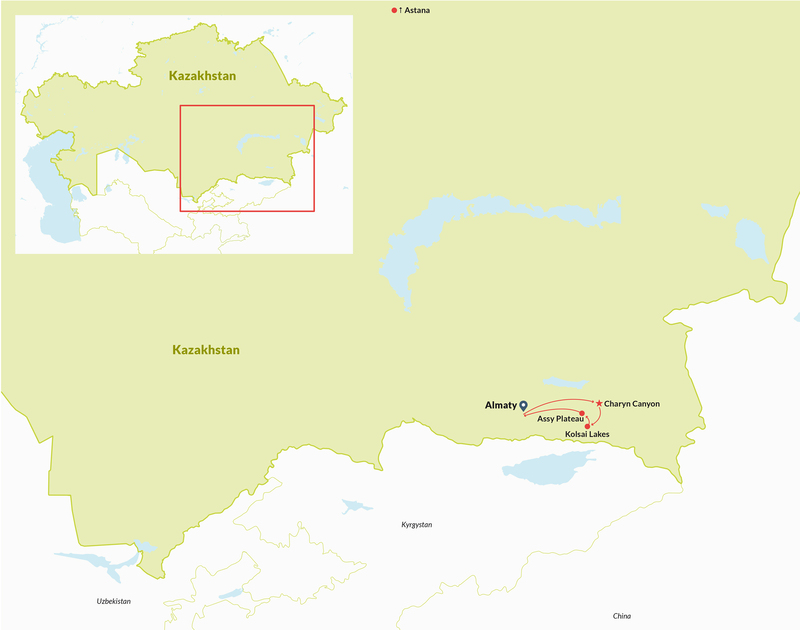 Return to Almaty 6 hours including stops, there will be a stop at the Baiseit village for the light lunch. Price at two persons is €350 p.p., at four persons €240 p.p. Please write us for other group sizes. All cost outside Almaty included except for alcoholic drinks. Price at two persons is €295 p.p., at four persons €185 p.p. Please write us for other group sizes. All cost outside Almaty included except for alcoholic drinks. In all cases a fee of €15 per booking (i.e. not per person) for the Dutch Guarantee Fund GGTO will be added.